Know Eagle Rock Class of 1965 graduates that are NOT on this List? Help us Update the 1965 Class List by adding missing names. The Aquilaeans will be having their 50-Year Reunion at the Glendale Hilton. At this time, we are still in the planning stages and undergoing the search for classmates. We also have a group on Facebook which will keep you informed of progress as well as have a place to meet up with old friends and post fun photos and stories. 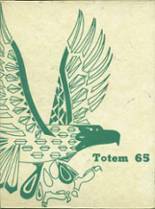 Look for 1965 Eagle Rock High School Aquilaeans and ask to be added. See you there! The ERHS Aquilaean Class of S'65 will have our 50th. year reunion on October 3, 2015 at the Glendale Hilton. We have sent out the initial "Save the Date" email to class members. If you didn't receive one,or have questions, please email me or Jean Horstman. More 1965 alumni from Eagle Rock HS have posted profiles on Classmates.com®. Click here to register for free at Classmates.com® and view other 1965 alumni. Missing some friends from Eagle Rock High that graduated with you in 1965? Check the list below that shows the Eagle Rock class of '65.